Live the high life in the glamorous and colourful city of Nice. Recognised as the unofficial capital of the French Riviera, Nice is bursting with art, museums and delicious restaurants, as well as beautiful parks and beaches all oozing with charm and character. However, you don’t need to tick off a list of attractions when you visit Nice, as this city is simply an attraction in itself. Stroll down the Promenade des Anglais that hugs the inviting seafront and bask in the allure of this cosmopolitan city. 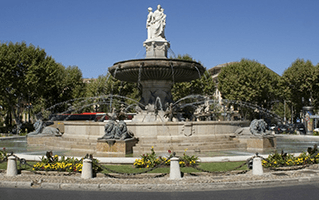 We have five pick-up points across Nice, including at Nice Côte d'Azur International Airport and Nice Railway Station. 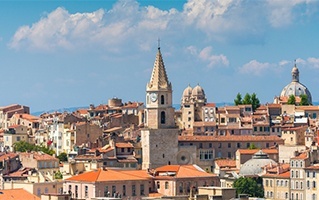 We know how much you’ll want to hit the road to explore Nice and the surrounding Côte d’Azur cities, which is why we pride ourselves on offering a simple, hassle-free service. With mansions sitting proud on a dramatic sweeping promenade, Nice is a city of understated and sophisticated beauty. But it also has substance, with an eclectic mix of restaurants, many fascinating attractions and a history that yearns to be explored. 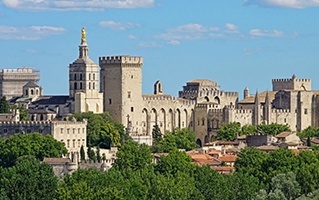 When you hire a car you can savour the city but also seize the opportunity to travel down the glorious French Riviera. The French painter and sculptor Henri Matisse was once a resident of Nice, and his iconic work and memory has been captured in the Matisse museum that sits up high on Cimiez Hill. It’s a well-curated collection of his life’s work, and a wonderful way to lose a few hours in the city. If contemporary art is more your thing then enter Musée d'art moderne et d'art contemporain (MAMAC) on Place Yves Klein and take in the thought-provoking exhibitions that are held throughout the year. Vieux Nice, the Old Town, is bursting with things to capture the mind. You may well smell the Cours Saleya before you see it, a market place filled with stalls for you to browse. Pick up knick-knacks, souvenirs and take in the colourful and scented show of blooms from the popular flower quarter. Take a seat along the harbour and watch the array of boats and yachts as they come in and out of the port. Crystal clear waters and the glorious sunshine make it an afternoon well spent. You can take a culinary adventure down the Côte d’Azur and savour some of the finest French food, and there’s no better place to start your tasting journey than Nice. Enjoy a salade niçoise - that timeless combination of eggs, tomatoes, olives and anchovies - on the seafront or grab a pan bagnat – basically the same thing but in a sandwich - whilst strolling around the city. After this, jump in the car and continue on your adventure to Èze, a hilltop town with a style all of its own. This old-school, authentic place has eschewed the glamour of Cannes and Saint-Tropez, and serves up a traditional menu to match. As well as fine dining with incredible views, such as at Chateau Eza, Èze hosts foodie festivals and offers cosy and intimate cafes and restaurants. This no-fuss dining means you can enjoy simple but delicious French food in places such as Le Nid d’Aigle, a friendly spot for grilled entrecote with herbs or snails with parsley butter. No trip to Nice would be complete without visiting the nearby principality of Monaco. While here, go and brush shoulders with the rich and famous in Monte Carlo. Found just off the A8, you can test your luck and gamble at Monte Carlo Casino, visit the ornate 13th century Palais Princier, home to the Sovereign Prince, and explore sea life at the Oceanographic Museum. It’s a surreal place to visit, and feels every inch like a film set. With streets stirring with locals and tourists alike, and the wealth of attractions on offer, driving in Nice is a real adventure. Picturesque views, enticing markets and a stunning old town are all waiting to be explored. Nice is neatly laid out, so you can head to almost any part of the city with ease. The Promenade des Anglais lines the coast, while the A8 runs across the top of the city and stretches out to the nearby towns. If travelling away from the centre of Nice, exploring the rest of the French Riviera is a road trip you’ll never forget. You could be enjoying lunch in Cannes one day before jumping in the car and heading to the beaches of Saint-Tropez. Roads are good quality and straightforward signage makes it easy to navigate. When leaving Nice, you’ll likely travel on a high-speed autoroute (highway). Take the A8 to Cannes and enjoy a direct route that still allows you to enjoy exceptional scenery. As you’re travelling, you’ll likely encounter a number of toll roads in France. Speak to our friendly staff if you have any questions about using them or how to pay and they’ll be more than happy to help. They’re often a way to travel between cities quicker than on minor roads. Speed limits vary from road to road, with a top speed on highways of 130 km/h, while built-up areas drop to 50 km/h. There are lower limits in wet weather, and seat belts must be worn by all the occupants of a car. If you have any specific questions about driving in France or wish to know what objects you must carry in your hire car, our team at your pick-up location in Nice will be more than happy to help.